Renovating New York City’s buildings to high-performance standards when they change hands is crucial to the City reaching its ambitious goal of an 80% reduction in greenhouse gas emissions by 2050. 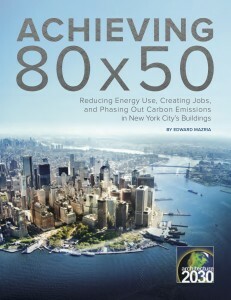 That’s the key finding in the latest Architecture 2030 report Achieving 80×50: Reducing Energy Use, Creating Jobs, and Phasing Out Carbon Emissions in New York City’s Buildings, presented by Founder and CEO Edward Mazria last week at a major event in New York City hosted by coalition and community-building organization ALIGN: The Alliance for a Greater New York. New York City contains about one million buildings comprising 5.75 billion square feet of building stock. Its buildings are responsible for 71% of the city’s greenhouse gas emissions (GHG) and 94% of its electricity consumption. While requiring new buildings to become more efficient and renovating city-owned buildings are both important, in order to meet the city’s greenhouse gas emissions reduction target by the year 2050, most of the city’s existing building stock must also be renovated to high-performance standards over the next 35 years. The key to addressing New York’s existing building stock is private sector building purchases. There are about 26,000 buildings bought and sold in New York City each year, meaning approximately 900,000 buildings will change hands over the next 35 years. Conduct non-intrusive efficiency upgrades (the ‘low-hanging fruit’ that does not disturb building occupants) and purchase non-GHG emitting renewable energy (from new renewable energy generation installed within the metropolitan area) to meet the City’s emissions reduction targets. The first option creates additional efficiency construction investment, and the second creates minimum efficiency upgrades and weatherization, and a robust market for renewable energy generation, both leading to long-term investment, job growth, and emissions reductions. The emissions reduction standards and efficiency requirements would be administered primarily through New York City’s building energy code, which would be updated every three years to more stringent emissions reduction (fossil fuel energy consumption) requirements. Since buyers are likely to finance or invest funds for building purchases (and in many cases planning to renovate), the additional expense to renovate to high-performance standards is minimal when compared to the purchase and renovation cost. reduce energy consumption and energy bills. 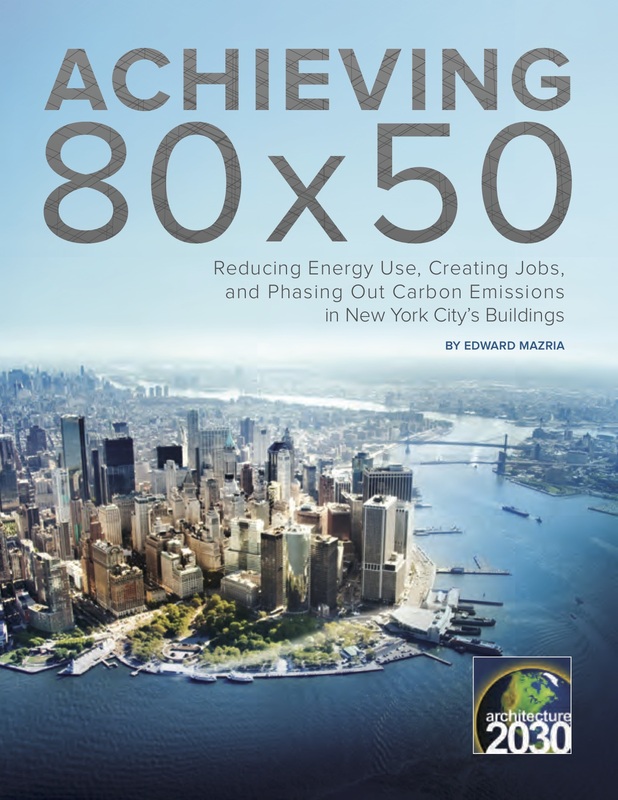 “Achieving 80×50 is a practical and powerful plan to ensure that New York City can reach its bold and necessary emissions reduction targets,” said Edward Mazria.